Sea Breeze, Edgewater904T2 can be your Perfect Place in Paradise! Enjoy the Sea Breeze in the Great Room with plenty of seating and room for fun! Beautiful coastal decor with a fantastic view of the Gulf and a man-sized TV and leather recliner, too! There is no better place than your private balcony to be watching the waves and the sand! Comfortable coastal cottage themed decor with all the comforts of home. Plenty of room for the family! The queen sleeper sofa gives room for more guests. You'll get a good night's sleep on this sofa's luxury gel mattress. There's even a second full bath to give everyone a little more space! Eat in the dining area or out on the balcony. Everything tastes better at the BEACH! Elegant dining table for 4 with additional seating at the bar. Miles of sugar-white sandy beaches and emerald water! Gentle Family Friendly Waves. Well equipped gourmet kitchen with an ocean view, granite counter tops, updated appliances, including a Keurig machine and a washer and dryer, too. Plenty of room in this kitchen for cooking with family and friends! You'll love the washer dryer that's tucked away in the kitchen, too. 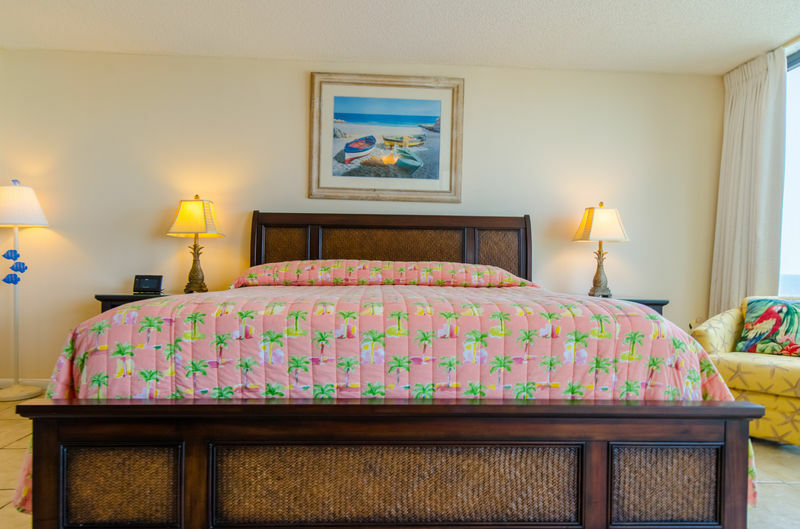 The Grandview Master Suite has a comfy king-sized bed with a foam mattress topper for added softness! You'll feel like you are sleeping on a cloud with our luxurious high thread count sheets and soft pillows. The master suite has floor to ceiling windows with a grand Gulf view. Sleep to the sound of the gentle waves and wake up to the panoramic view! Wow is the only way to describe this. Private access to the balcony from the master suite, too. Enjoy your own large TV and dual closets for storage. Cozy, private Master Suite nook for enjoying the ocean view in comfy swivel chairs. Wonderful for morning coffee or evening drinks. The Master Bath has a separate dressing area. The Grandview Master Suite's bathroom has a tub/shower combo with a shower massage for a relaxing shower after a day of fun in the sun! 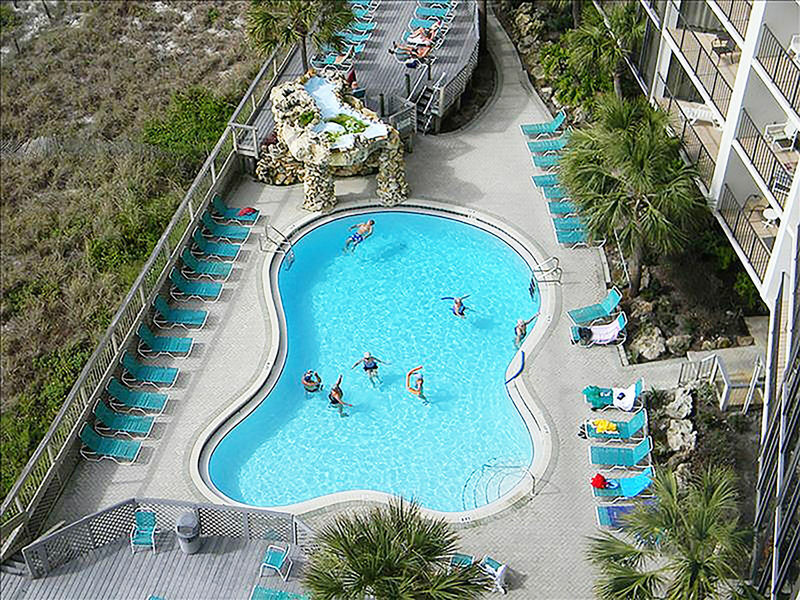 Edgewater Beach Resort has many pools and other amenities. This is the pool adjacent to Tower II, it's heated with a waterfall feature! There is also a hot tub on this pool deck. The second bathroom has a shower, single vanity and toilet. This is a big plus when everyone is trying to get ready to go out for the day! The second bathroom has granite counter tops and is all tile. Great for use by guests sleeping on the sleeper sofa. The balcony is a shady place to watch the sunny beach! Plenty of chairs and tables for relaxing and snacking overlooking the ocean! Yes, this is REALLY the view from your balcony in Sea Breeze! We call Edgewater Tower 2-904 Sea Breeze because it's easy-breezy! 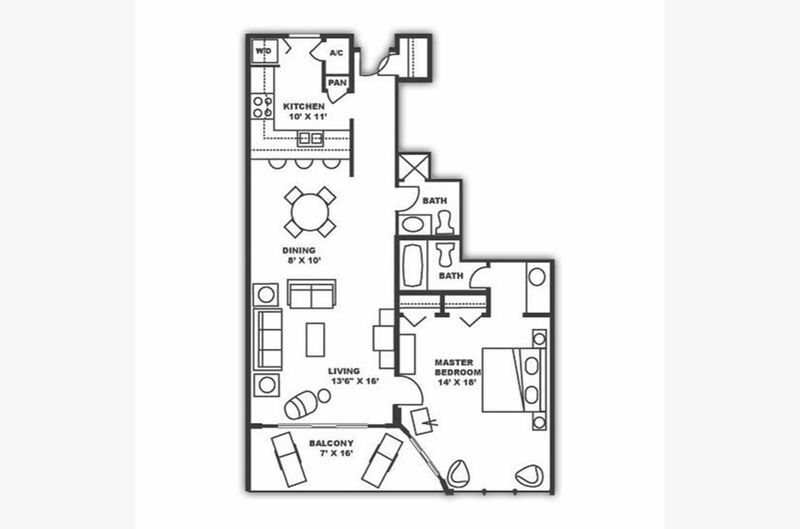 This is an example floor-plan. Furniture size/arrangement may vary. Contact us with any questions! 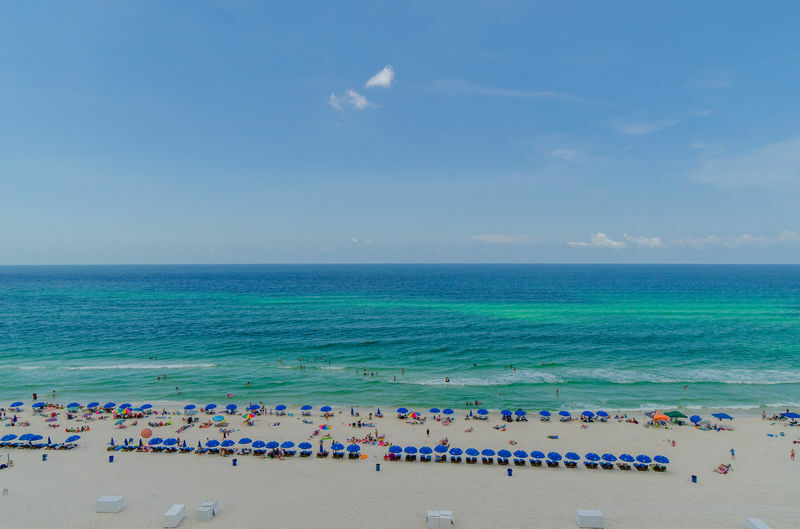 "Sea Breeze," Edgewater 904T2 has fantastic views of the Gulf Of Mexico from our 1 bedroom, 2 bath deluxe condo that has all the comforts of home. 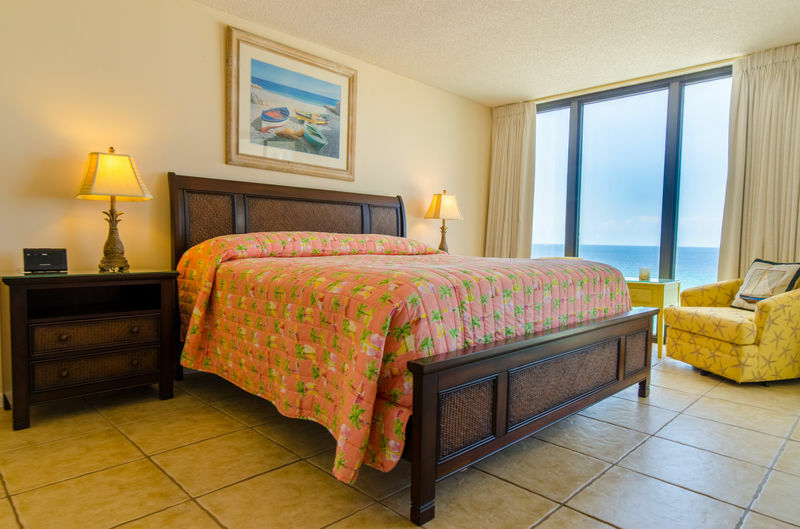 Comfortably sleeps up to 4, two in the king sized oceanfront master suite and 2 on the queen sleeper sofa with comfy gel mattress in the great room which is also oceanfront. Emerald Beach Properties welcomes you to Edgewater, your Perfect Place in Paradise! Complimentary wireless encrypted internet for our guests. This is private for our guests only and allows multiple computers to login wirelessly at the same time at no additional cost. Please contact us for current specials and great discounts! Phone: 850-234-0997, Toll Free 844-808-7272. Click Here to E-mail Us. You'll fall in love with the bright red striped sofa & love seat in the family room. Curl up in the comfy leather swivel recliner. Relax in the yellow teacup swivel chair. 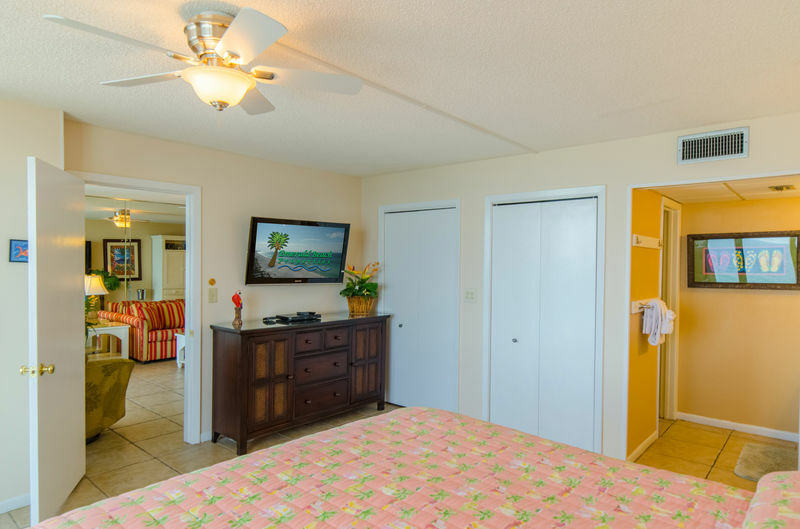 Swivel to see the fabulous ocean view or swivel to see the man-sized 50' flat screen wall mounted TV. Watch your favorite shows or sports on cable or use the DVD/Blue-ray player to watch movies. Listen to your favorite music on the stereo, you can bring your own CDs or use your mobile device. 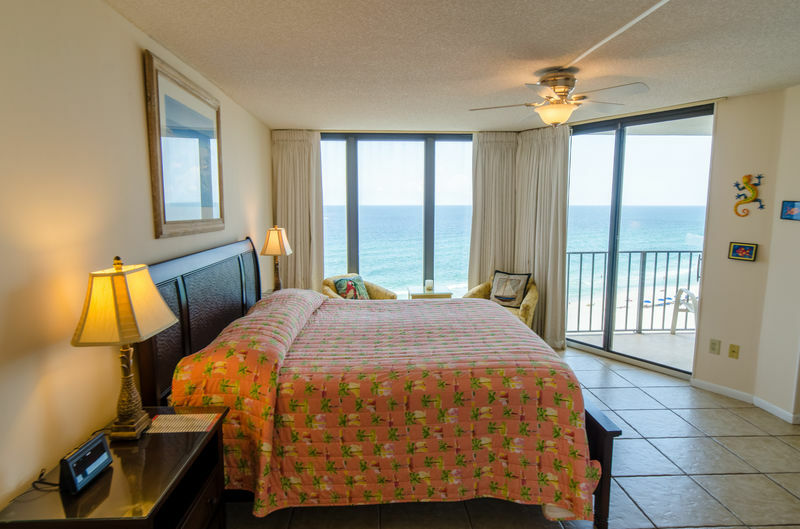 The Grandview Master bedroom boasts a gulf front view with a king sized pillow top bed and a private bathroom with a tub/shower combo. The bright, cheerful furnishings include ample storage, a hand painted TV console, 2 swivel chairs and table for private conversation. The bed's memory foam topper makes this a comfortable retreat. The wall mounted flat screen TV has a DVD player. The clock radio can be used with your mobile devices, too! Edgewater is a kid friendly place! There's always lots to do. We even provide a pack 'n play for our guests who need a crib for baby. Please bring your baby's favorite bedding, since this is not provided in the linen package. The kitchen has everything you'll need to prepare a gourmet meal or quick breakfast, lunch or a special snack. Dishes, pots, pans, silverware, blender, drip coffee maker and a Keurig machine, too! See the ocean from your kitchen and have plenty of room to cook and enjoy your vacation. The dining area has a table and 4 chairs with 2 bar stools. This makes it comfortable to eat in or to sit and play board games or cards. The second full bath is decorated in bright tropical colors. It is a great guest bathroom and is also perfect for those who are sleeping on the sofa bed. It makes getting ready to go out so much easier when everyone has their own bathroom! They don't call them 'The World's Most Beautiful Beaches' for nothing!! In this condo, you'll be sleeping 'right on the beach'. This unit is has spectacular sunset views from the bedroom, living room and balcony. Walk to shops and restaurants. Pier Park is just a short drive away. 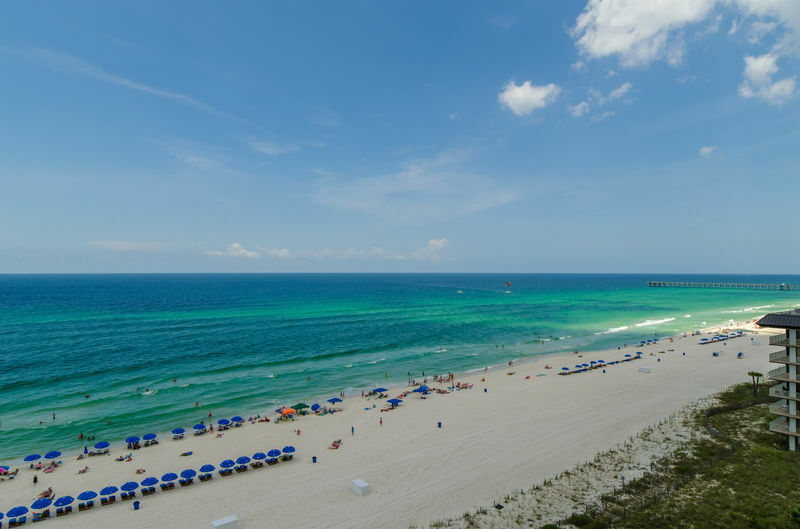 There's always something new to do in Panama City Beach! You're gonna love this place!! !